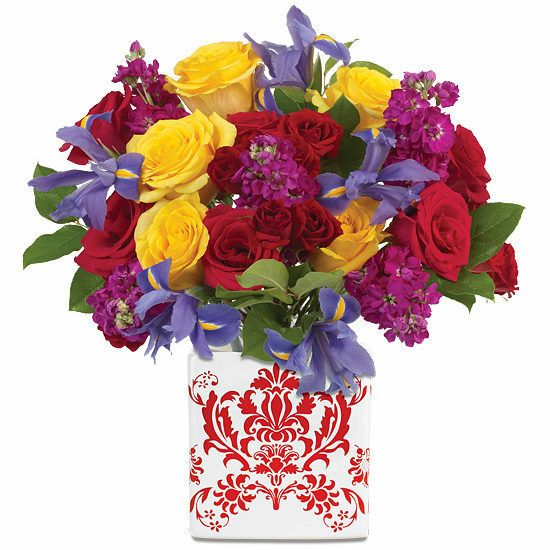 A celebration of all things beautiful, this abundant bouquet makes a spectacular surprise for any occasion. 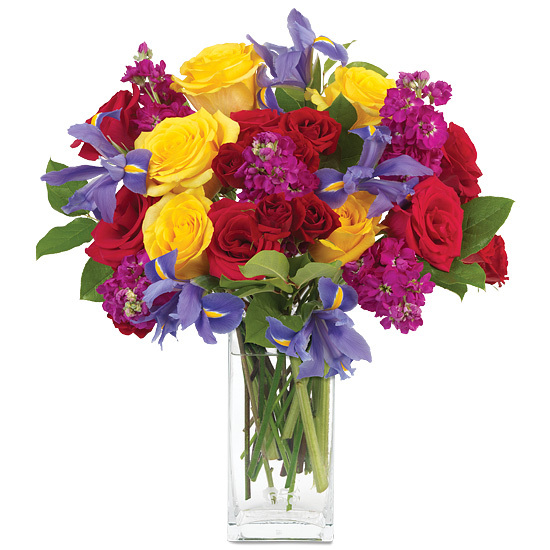 Virtually every color of the spectrum is here, represented by roses and so much more – red Mikado spray roses, blue Telstar iris, yellow Skyline roses, and pink Hot Lady roses, all surrounded by the gorgeous green of natural salal and the spicy scent of magenta stock. Our stylish square vase is clearly the ideal showcase to complement the bright blooms. Remove all foliage that will fall below the water line. Remove the “guard petal” from each rose – this is the outermost petal left on to protect the bud during shipment. You may also remove any petals that may have slightly bruised during shipping. Trim 2″ on a diagonal from the bottom of each stem. We recommend cutting the stems underwater for best blooming results. Be sure to leave enough room to allow the ever-emerging iris to open fully. Add fresh water daily and re-cut stems every other day.